I come downstairs to see a pile of dishes in the sink. I hate dishes. Unfortunately, I’m in this tough spot where I don’t want to do them and yet I have not yet assigned responsibility of them to anyone else. Sure, we say its our kids’ job is to unload the dishwasher. However, it doesn’t happen automatically. How does he know how to procrastinate at 4? I know what happens. He promises to do some household chore and then conveniently forgets when he comes home. I’ve read all these parenting books about how you should let your child determine WHEN to complete a particular task. However, what if that task isn’t done? Do we live with a sink of dirty dishes and eat off paper plates while the flies start swarming around the stuck on pasta from dinner last night? If you’re like me, you eventually get tired of nagging and dodging the neverending excuses and do the task yourself. Oooh, it’s time we changed. Our children shouldn’t be getting a free ride. I make so many excuses for my children. My daughter just had 3 hours of dance practice. She’s tired and still has homework. I can take care of the dishes real quick for her. My son has bug bites. He’s in pain and grumpy. What harm would it do to just water the plants instead of dodging his complaints? I’m lazying-out as a parent. WAIT… WAIT!, you say, What do you mean LAZY JoAnn? You and I are both working our butts off trying to provide for our families, give our kids all the best opportunities and keeping everything organized. The definition of lazy is “unwilling to use work or energy.” Yes, we are keeping busy doing ALL the things. But we are avoiding the hard work of teaching our kids how to take all these tasks over. In her book The Gift of Failure: How the Best Parents Learn to Let Go So Their Children Can Succeed, teacher Jessica Lahey states the importance of having kids make a meaningful family contribution. Lahey talks about her experience as a teacher, where she would review and write recommendations for dozens of college applications. These kids had impressive resumes with volunteer work, building latrines in Haiti and serving at their local soup kitchen. However, she knew for a fact that these same kids didn’t know how to do their own laundry. Everyone needs a sense of purpose. Before that purpose can be fulfilled in the world, it first needs to be realized at home. 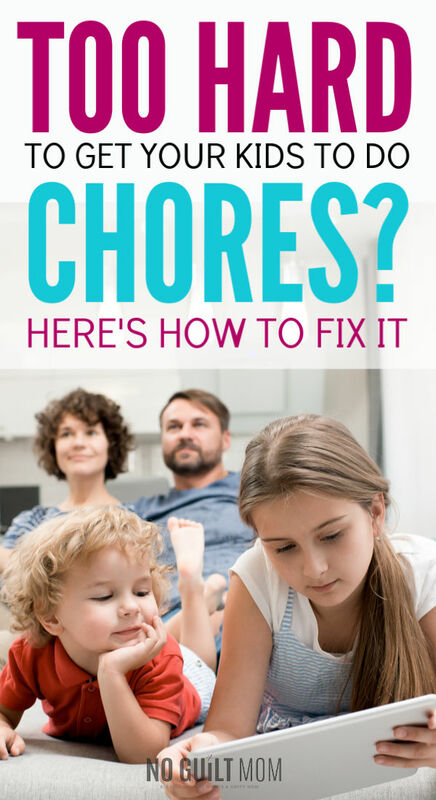 Contributing to the success of the family by taking on household chores is how we do that. In a bleaker view – and this is something I’ve seen mentioned in both The Gift of Failure: How the Best Parents Learn to Let Go So Their Children Can Succeed and Cleaning House: A Mom’s Twelve-Month Experiment to Rid Her Home of Youth Entitlement – “lack of purpose” is one of the top reasons patients tell physicians for attempting suicide. Hearing this makes total sense and it scares me. When we give our kids household responsibilities, they have a purpose. Without them, the dog goes hungry, the family can’t eat meals, everyone wears dirty clothes. The key however is enforcing this and not stepping in to save the day when that responsibility is left unfulfilled. That’s the hard part. It’s so, so, so hard. Yup. It’s totally my fault. I made the grave mistake of not thinking them capable of contributing more to the family and I am deeply sorry. But it’s ok, we’re going to fix this. Every single person performs at a higher level when they know EXACTLY what’s expected of them. The problem is – at least with me – I get so wishy-washy with my expectations. One day it’s unload the dishwasher. Then, I want them to clean bathrooms. Next, I want to make sure they pooper scoop the yard. It’s way too much for me to keep track of. Even though my intentions are good, I forget what I said and then I feel completely overwhelmed and stressed out because no one is helping me! We started with a job for each of them. My daughter is in charge of unloading and loading the dishwasher. Her brother helps put away the silverware, but ultimate responsibility lies with her. This is a big job to start with. And initially, she said how unfair it was that her brother didn’t have to do more. I get that. He’s almost 5. He’s capable as well. For him, we asked him to make sure the dogs always have full water dishes. And… since he has expressed an interest in this from a very early age, we’re teaching him to scoop the cat litter box. My daughter has a very easy to trigger gag reflex so she was more than happy at this distribution of labor. Once that job is assigned, it is out of your hands. But oh wow, that’s super hard. Right now, there is a pile of dishes next to my sink at home. I walk by it and cringe. Seeing that stack makes my heart beat a little faster. But it is no longer my responsibility. It’s my daughter’s. And if I do it, I am NOT helping her out. Instead, I’m subtly delivering the message that she is not capable of this task and therefore needs me to do it for her. That’s not what I want to tell her. I want her to know that she is capable of anything that comes her way. If she can conquer the dishes on the kitchen counter every morning (or evening), she will also have the stamina to do other tasks that she completely detests and yet are CRUCIAL for her success. Are you ready to change the division of responsibilities in your home? By admitting your mistake, starting simply, keeping your kids accountable and refusing to do the task yourself, you are teaching your kids how to care for the family and developing their confidence.